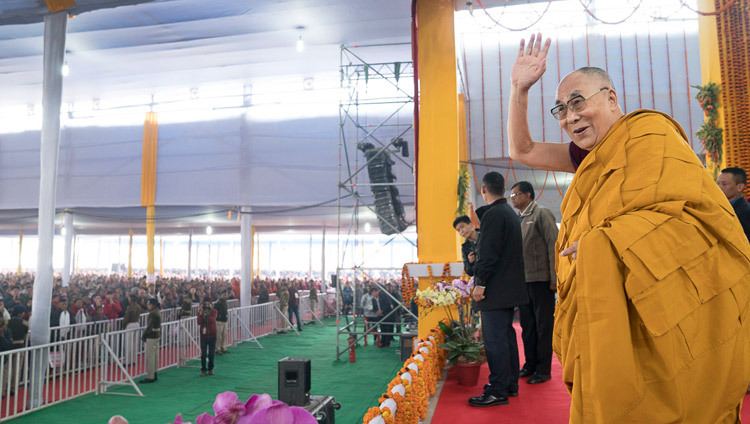 Bodhgaya, Bihar, India – On the third day of teachings requested by the Nalanda Shiksha, the cold fog lifted and the sun shone as His Holiness the Dalai Lama drove to the Kalachakra Maidan. Following the recitation of the Mangala Sutta in Pali, children of Maitreya School recited the ‘Praise to the 17 Masters of Nalanda’ in Sanskrit. This prompted His Holiness to reflect what magnificent scholars they were and how important it was that the Buddha established his teachings on the basis of reason and logic. “How wonderful it is that these various masters’ writings are still available to us. We can read and study them, use them as our text books, and we can pass on what they had to say to others. His Holiness carefully guided the audience through a visualization of the Buddha surrounded by the eight close bodhisattva disciples, including Maitreya and Manjushri, pioneers of the lineages of the vast and the profound respectively. He mentioned Nagarjuna and Saraha, the 84 Mahasiddhas, Mahakashyapa and the seven patriarchs who came after the Buddha. From the Nyingma tradition he suggested the trio of Shantarakshita, Guru Padmasambhava, Trisong Detsen, Padmasambhava’s 25 disciples, and so forth; from the Kagyu tradition Marpa, the great translator, as well as Milarepa and Gampopa; from the Sakya tradition, the Five patriarchs who came after Virupa and the upholders of the Sakya, Ngorpa and Tsarpa traditions; Atisha and Dromtönpa and the members of the Kadampa tradition; Je Tsongkhapa and his disciples like Jampel Gyatso and holders of the Sey and Ensa lineages—all of whom would be witness to the great aspiration to enlightenment for the sake of all beings. His Holiness followed this by leading the audience through the ‘all encompassing yoga’, which adds experience of ultimate bodhichitta to the earlier aspiration. 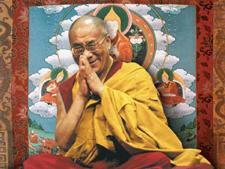 He concluded by giving transmission of the mantras of Buddha Shakyamuni, Avalokiteshvara, Manjushri and Arya Tara. There was a short interval waiting for the arrival of the Chief Minister of Bihar, Shri Nitish Kumar, who was coming to take part in the release of the English translation of the first volume of ‘Science and Philosophy in the Indian Buddhist Classics’. The Chief Minister entered the teaching ground promptly walking at a brisk pace and joined His Holiness on the stage. For the Office of His Holiness the Dalai Lama, Tenzin Taklha welcomed him and without further ado invited Dr Thupten Jinpa, General Editor of the Series, to introduce this first volume – ‘The Physical World’. “This series was conceived by His Holiness the Dalai Lama himself and compiled under his careful supervision by a team of scholars over many years. It brings together classical Buddhist scientific and philosophical explorations of the nature of reality, within a framework that is accessible to the modern reader. Of the four volumes in the series, the first, which focuses on the science of the physical world, is being officially released today. “The creation of this series represents a truly historic achievement. Firstly, the careful extraction and organization of the views of the great Indian Buddhist thinkers within a framework of scientific enquiry is in itself a revolutionary achievement in the history of Buddhist thought. Thanks to His Holiness’s vision, contemporary readers have for the first time an opportunity to engage, from a scientific perspective, with ideas and insights of Indian Buddhist thinkers. “Secondly, these volumes have the potential to make a significant contribution to the history of ideas. To date, the history of ideas, especially of science, remains predominantly Eurocentric, with little attention paid to the great civilizations outside the Western world. These volumes on science, however, document a sophisticated tradition of scientific thinking that flourished in ancient India. The great Indic schools all developed sophisticated understandings of the workings of the human mind, as well as meditative techniques for training and regulating our mind and emotions. “Thirdly, given that all the classical Indian sources gathered in these volumes were drawn from the two Tibetan canonical collections of Kangyur and Tengyur, the creation of this special series also represents an important gift to India and to the world from the Tibetan people of the Indian traditions the Tibetans have kept alive. Dr Jinpa went to acknowledge the symbolism of the Honorable Chief Minister of Bihar joining His Holiness the Dalai Lama in the official launch of this series. It recalls the traditional teacher and disciple relationship between India and Tibet and their shared heritage of Indic knowledge. He also remarked that lately, His Holiness has been speaking of his commitment to help renew awareness of the knowledge of classical Indian traditions, among the younger generation of Indians. He ended by acknowledging Dr Ian Coghlan, who undertook the English translation, and the book’s publishers, Wisdom Publications in the United States and Simon & Schuster here in India. Addressing the gathering in Hindi, Shri Nitish Kumar said how happy he was to be attending this function in the presence of His Holiness. He recalled that he also came to Bodhgaya last year during the Kalachakra ceremonies. He expressed pleasure that the publication of this series of books will make insights of the Nalanda Tradition available to a wide readership in their own language. He also felt it was fitting that the first volume in English was being launched in the state that includes the site of the Buddha’s enlightenment, as well as the great universities of Nalanda, Vikramashila and the recently discovered Telhara. He thanked His Holiness for inviting him on this occasion. “My friend the Chief Minister is a sincere man,” His Holiness responded, “and the release of this book here today is a special occasion for us all. He has already revealed his spiritual interests with the establishment of the Buddha Memorial Park in Patna. Perhaps he and I have a karmic connection reaching back to the time of the Buddha. “When we first arrived in exile in India we had a wide range of problems to deal with. However, in due course it became clear that the psychology, philosophy and logic that we studied in Tibet from childhood had a wider relevance in the world today. It seemed to me that the science of mind, philosophy and logic in our literature could be studied in an academic way beyond the context of religion. By coming to better understand the workings of the mind, we can learn to tackle our disturbing emotions and mental afflictions, something we can’t do with either weapons or money. “If we think of our literature in terms of science, philosophy and religion, the religious part is only of interest to Buddhists, but the science and philosophy can be of interest to anyone. I believe we can profitably incorporate ideas and values from these writings into the modern education system. In a world in turmoil because of people’s unruly minds, what we are doing is not propagating Buddhism but exploring how we Buddhists can contribute to the well-being of humanity.